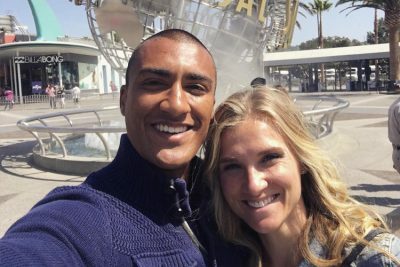 U.S. Olympian Ashton Eaton supports wife Brianne Theisen in the 2016 Olympics—despite the two being from different countries. Ashton Eaton is the reigning 2012 Olympic decathlon champion and world record holder in the decathlon; he has even won the world championship every year in the decathlon and indoor heptathlon since 2012. Brianne Theisen-Eaton is a Canadian who competes in the pentathlon and heptathlon Olympic events. The couple’s events are (mildly put it) for ultimate athletes. The decathlon is a combination of javelin throw, high jump, long jump, pole vault, discus, shot put, 100-meter dash, 400-meter dash, 110-meter, and 1,500-meter run. The heptathlon contains seven events: the high jump, shot put, 100-meter hurdles, long jump, javelin throw, 200-meter dash, and 800-meter run. The pentathlon is a slightly different event that includes fencing, horse riding, shooting, swimming, and running. Ashton Eaton, 28, is looking to repeat as decathlon champion at the Rio Olympics. Eaton won the decathlon at the 2012 London Olympics with 8,869 points, and holds the world record in the decathlon with 9,045 points at the 2015 world championships in Beijing, China. Brianne Theisen-Eaton, 27, just captured the bronze medal in the heptathlon at the 2016 Rio Olympics with 6,653 points. Ashton Eaton and Brianne Theisen both train hard and eat healthy together. So, what is the Eaton couple diet plan that allows the couple to compete and have success in the most grueling competitions in the world? 1. Protein is king: Protein is necessary for the athletes to build and repair their muscles, which are constantly being damaged through excessive competitions like the decathlon and heptathlon. 2. Full-Fat is important: The low-fat craze doesn’t make sense to the couple. Full-fat foods actually keep you feeling full, and allow your body to absorb certain nutrients. 3. Eliminate refined carbs: The couple consumes natural grains like quinoa, amaranth, and millet, and they also enjoy Ezekiel bread. They also replace potatoes with sweet potatoes. 4. Eat lots of veggies: The couple eats a serving of vegetables at lunch and dinner. They also replace baked potatoes or french fries with steamed vegetables or a side salad. 5. Cut out sugar: It is hard to cut out sugar completely; however, the couple tries to limit their sugar intake to maple syrup, honey, and fruit. Store bought sauces and dressings have lots of added sugar. As a result, the couple makes their own salad dressings and spaghetti sauces. 6. Limit liquid calories: When the couple is tired of plain water they consume fizzy water with fresh lemon. They also rarely drink alcohol, and consume black coffee with added sugar, milk, or cream. For breakfast the couple may eat Greek yogurt with granola with a little honey. Ashton Eaton says he eats a very large, protein-rich breakfast a day before a competition. For example, he’d eat two cups of Greek yogurt with granola, bacon, eggs, and toast. Lunch is often a combination of pickles, meats, cheeses, carrots, green beans, or any type of vegetable. Dinner contains different protein sources throughout the week like pork, fish, steak, or chicken. It also contains salads and raw or steamed veggies. Diet is certainly important for any athlete, but it is especially crucial for a decathlete like Ashton Eaton. 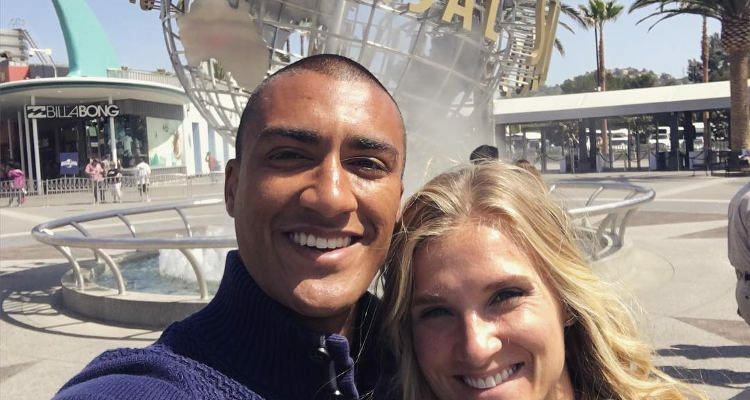 Both Ashton Eaton and wife Brianne Theisen-Eaton follow a very healthy daily diet that allows them to have success in their respective competitions. Darby, L., “The Real-Life Diet of Olympic Decathlete Ashton Eaton,” GQ website, July 29, 2016; http://www.gq.com/story/the-real-life-diet-of-olympic-decathlete-ashton-eaton. “Our Nutrition Philosophy,” Eaton website; http://www.weareeaton.com/blog/2015/7/6/our-nutrition-philosophy, last accessed Aug. 18, 2016.